I love our visits to my sister’s home in Phoenix. She and I have a field day cooking and sampling new dishes, but we especially enjoy visiting the many wonderful restaurants in the area. Some, like Pomegranate Cafe, are vegetarian/vegan; others, like Flower Child, offer a varied menu with healthy vegan options. On our last visit, I sampled a bright yellow, Turmeric Latte. It was mellow and a delicious blend of non-dairy milks and the healing spice. Turmeric has been all over the Internet of late. Article after article touts its remarkable inflammation-fighting qualities courtesy of the curcumin contained within. Consuming turmeric on a daily basis is highly recommended. I acted on a tip from Dr. Greger in his book, How Not To Die (get it if you don’t have it already!). I bought a bag of fresh turmeric while in Phoenix and brought it back to Houston, tossing it in my freezer. I pull a little out whenever I need it. Back home I couldn’t get that yummy, yellow, mellow, warm latte out of my mind and so I embarked on a Google search hoping to discover a comparable recipe. I tried several I came across without success (read: gag). In desperation I even experimented with turmeric lemonade (thumbs down). 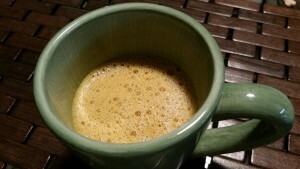 I was about to give up when I stumbled upon a fantastic recipe at Mykitchenshrink. It’s the absolute best! 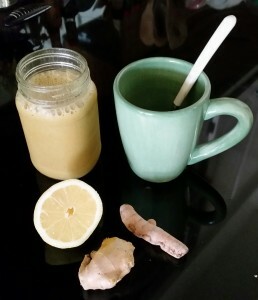 In fact, I could start every morning with my hands wrapped around a warm cup of this health-promoting sunshine – almond milk, fresh turmeric, fresh ginger, lemon slice, agave nectar, cinnamon, along with pinches of both black pepper and cayenne. Perfection! Pour all ingredients into a Vitamix or blender and mix until smooth. Pour into a small saucepan and bring to a light boil, whisk to combine ingredients. Reduce heat to low and simmer for up to 10-15 minutes. Strain the milk if you have large pieces of ginger, cinnamon, peppercorns, etc. Notes: Try using Stevia instead of honey for a reduced sugar drink! Going to fix the tea for sure! Thanks!! !